Home / Unlabelled / 11 May 2016 UNITECH AWARENESS EVENT EXCEEDS ALL EXPECTATIONS. 11 May 2016 UNITECH AWARENESS EVENT EXCEEDS ALL EXPECTATIONS. 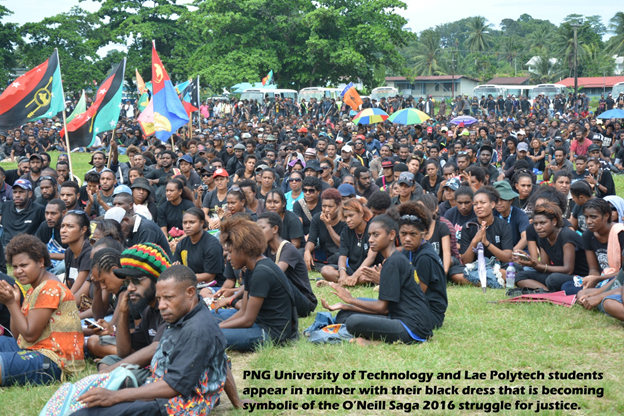 The growing national people’s movement to remove Peter O’Neill from power took a significant step forward yesterday with a well organized and attended awareness program conducted by students from the PNG University of Technology, Lae. The Eriku oval was filled despite the relatively short notice and usual blind eye of the national newspapers in publishing anything that might share the students’ viewpoints with the public. This event built upon what students of the University of Natural Resources and the Environment have started. UNRE students had the idea of occupying the time that is being freed up by their boycott by educating themselves and then going out an educating the public. UNRE students set the standard this year for developing a people power movement for all of PNG. Now PNGUOT students have brought this to a higher level. Yesterday’s awareness also set a refreshing example for how enforcers of the law should behave in a democratic society. Unlike the police state-dictator alliance that now grips Moresby, Lae police went out of their way to uphold basic PNG constitutional and God given rights to freedom of assembly and free speech, even when if that free speech offends a few. Lae Metropolitan police commander Anthony Wagambie set simple rules that emphasized peaceful protest through an awareness rally. In return, PNGUOT students emphasized the importance of nonviolence throughout the talks. Unlike our PM, their message sounded genuine, and backed it up by results, in this instance, producing an event without incident. The normally paranoid Eriku shopkeepers kept their doors open and business flowing. In leading India’s independence movement, Gandhi was relentlessly stubborn but always peaceful. Any violence at a Gandhi sit-in or demonstration was perpetuated by the government. Gandhi’s demonstrators always turned the other cheek even when savagely beat with police sticks. The power of nonviolence ultimately defeated the British colonial government. PNGUOT’s students seem to be getting the picture. Yesterday’s Lae crowd yesterday was estimated at upwards of 3,000, divided roughly into two groups. Most conspicuous with their black shirts and colourful provincial flags were the students of PNGUOT and PNG POLYTECH. The second group was surprising in its diversity, consisting of the employed and unemployed, young and old. The audience reflected PNG society. Mothers and grandmothers sat attentively with kids beside them. Hopefully the older children picked up on some of the educational messages, since the O’Neill government’s mismanagement of democracy and the economy is likely to have negative effects many years from now. The rally lasted more than two hours and was full of substance. Selected students as well as community leaders gave a series of talks that finally set the perpetual lies of the government straight. The student speakers covered PNG’s current constitutional crises as well as its economic crises. In sharp contrast to the government’s strategy of disinformation and propaganda, any errors of fact the students made yesterday appeared accidental. There was a seriousness and openness in presenting sad truths about the PNG situation today. Dare we take hope from this event that PNG’s university students will assume the role of credible educators of the general public about what is really going on in PNG that both the government and print media have abandoned? It was pleasing to see the large number of students from the PNG Polytechnic Institute in Lae be part of the rally, as it shows that this is not a fight of PNG university students alone. All students will feel the economic pain of the O’Neill government’s mismanagement as truly severe austerity measures are forced upon PNG after the expected June government default on the insanely inspired Peter O’Neill UBS loan. A Martin Luther King slogan draped one of the buses that transported students to Eriku. The speakers kept returning to the theme of their struggle being a righteous fight for justice. They also repeated another message, that of perseverance. Over and over they stated that they aren’t backing down until justice is achieved for PNG by having the PM step down from office, ending what has clearly been nonstop obstructions of jutice by the PM. It would be hard to believe if any parents of PNGUOT students would not have been brought of what national challenge their children have taken themselves to be involved in. At the program’s conclusion, students and audience departed as peacefully as they came. No opportunists took advantage of the situation, possibly because nonviolence and peaceful coexistence can be contagious once it takes hold in a society. The principle of justice is just as addictive as the principle of nonviolence. Ultimately justice always prevails so long as enough people refuse to back down in promoting justice strongly, loudly, and peacefully. If a nonyielding stance and persisting activities to promote justice become the motivators of O’Neill Saga 2016, this PM will be no more successful than the British Empire in India in retaining his dictatorial perch. With the removal of the PM and his cronies from government, PNG will at last have another opportunity to become a country of democratic principles in practice as well as intent. If awareness events like the one held in Lae yesterday are taken on as the main student activity across the nation, the people will win in this saga. Awareness activities are effective only when they occur all the time. They cannot be weekly events in only a few places. Respect the territory that has long been occupied by the street preachers of PNG, but supplement those preachers with a second type of preacher of truth who provide facts that neither government nor PNG newspapers want us to know. After all, whether one preaches words of the Bible or messages of Truth and Justice, it all comes from the same heavenly source. Expect the government to oppose it all once they see the power the students are developing in their hands. When that occurs, it exposes them for what they are: Opponents of Truth and Justice.